Reactions to the term “big is beautiful” by the offended. 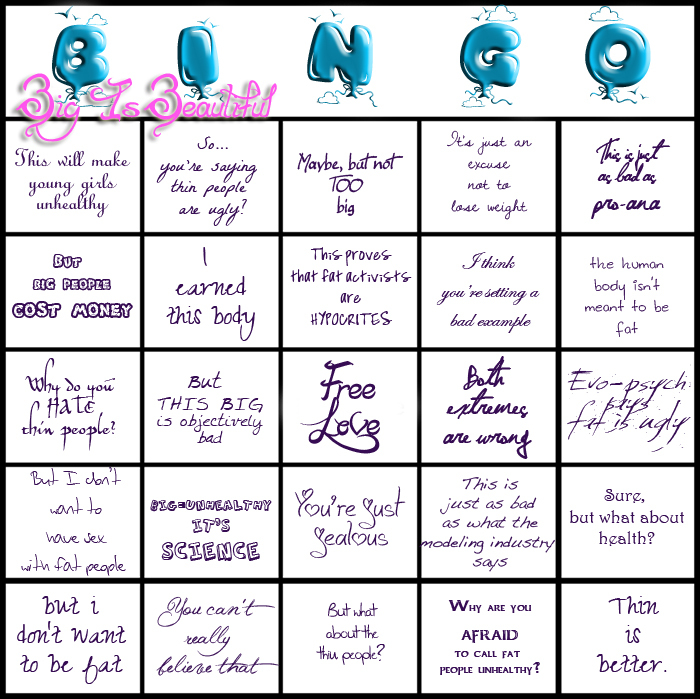 What inspired the Big is Beautiful Bingo Card were comments on the Pinterest post. I’m sad it’s been taken down, and that I x-ed out of the tab last night before going to bed or I would have gotten screenshots. The comments were — ah, breathtaking is a nice way of putting it? — though there were some great defenders, like Kate. The post it was inspired by seems to be missing; I get a 404 error. Heh, it appears as if the original post on Pintrest by Jane has been removed. But it looked like Sam at Big Liberty wrote a post about it in the meantime, and captured the original image. Yay! I’ll edit the post to include the image. It’s just too bad one can’t see the gross comments on that Pintrest site anymore — there were some people (like Kate) who wrote in defense, but many others who just heaped on the fat hate with vigor. God, how I hate the whole “HYPOCRITE!” line. To be a hypocrite means to say one thing and to do the exact opposite, and apparently, a large majority of the people that use that word have no idea what it means. 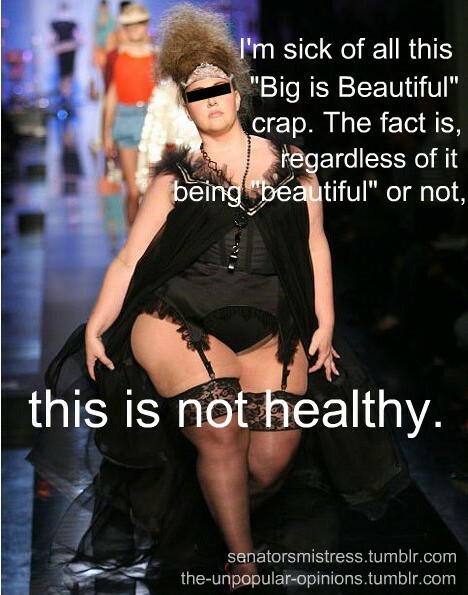 Promoting the idea of fat beauty while criticising the “thindustry” is not hypocritical because it is not our goal to advance our bodies as the only acceptable human forms out there as is the case with the thindustry.. We are not saying one thing-accept all bodies-and doing another, i.e. hating certain bodies. Thin bodies get plenty of attention, and we’re just leveling the playing field and we certainly don’t advocate hating any body. And I love how we’re having a discussion about beauty and someone throws the health trope in. It’s like once they realize they can’t bludgeon us with the Ugly Fatty McFatterson club, they go to OMG HEALTH to coerce us into changing our body shapes.